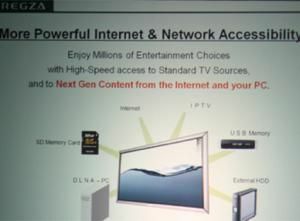 Toshiba's press conference was much as expected... but with a few surprises thrown in too. The company made a big deal of the global economic problems (who isn't?) but still pressed on with some nice high end sets. The whole thing kicked off with Tosh promising to make the world a more beautiful place with its TVs, and promising to add in more content via a link with Intel / Yahoo! 's Widget Channel. We at TechRadar have heard the whole IPTV spiel before... but the joint standard put together by Intel and Yahoo!, which is gaining more and more interest from TV manufacturers, seems to have a real shot at making it in the commercial space. However, some people will be less than pleased to hear that the system also integrates Microsoft's Windows Media Center Extender... it seems this content management arena might not have captured the world's imagination in the way it had hoped, so it's hard to see how this link up will change that perception. The launches from Toshiba went from the underwhelming to the slightly-better-than-OK, which is still good in the current economic situation. The release of another LCD / DVD player failed to ignite the passion in the room... the 26in model might show off some decent images but hardly looks like the epitome of style we think Tosh was going for. Vice President of TV Marketing Scott Ramirez's presentation was slightly more entertaining, and made use of the audience's attention to make some points about the TV market. Plans to release a new range of TVs, NOT badged as Regza as a move to 'beat the credit crunch', were met with some interest, even though the TVs were already launched. But the main excitement came from the launch of a new set of Regzas, in sizes up to 55in and sporting new prettier 'Lagoon' and 'Infinity' bezels. The specs on the TVs - including higher refresh rates and more accurate LED backlighting - might mean a lot to the TV-lover, but to the man on the street it's hard to see who will be interested in picking up these high end TVs when feeling the pinch on the wallet. But the addition of things like Dolby Volume - a great system to keep TV volume at decent level throughout watching - meant that Toshiba is going to be the first TV manufacturer to include the technology. Better HDMI integration and a more pixels were also the order of the day, but again, it's hard to see the normal user being excited by the new developments. But TechRadar did like the openness of Toshiba's predictions for the next year: Gradation is the new black; 240Hz is the new 120Hz, something about LED backlighting. Interesting. We came up with a prediction too: People will buy new TVs... but won't want to pay as much. And they probably won't care about the colour of the bezel. But Cell TV at least gives us a glimmer of hope for new technology in 2009... the smoothness of the picture might not appeal to some, but the ability to record six simultaneous HD channels is certainly exciting.